Reviewed: Iron Man Statue (Diamond Select Toys, 2017) | 'TAIN'T THE MEAT… IT'S THE HUMANITY! 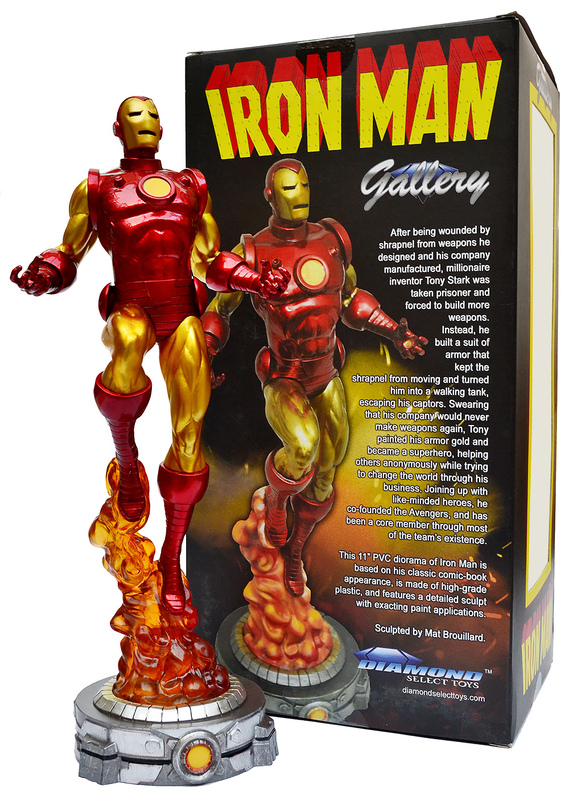 Marvel Comics’ golden Avenger Iron Man is immortalised in this dramatic statue from Diamond Select Toys. Released in the UK in June 2017 this Iron Man statue is part of Diamond Select Toys ‘Gallery’ range of PVC dioramas. The fully painted statue measures an impressive 12 inches in height and shows the red and gold superhero literally launching into action. The statue is based on a sculpt by Mat Brouillard, who perfectly captures the armoured avenger at his dramatic best: head raised; arms out stretched; ready for action. The metallic paintwork catches the light beautifully. The statue ships in a large cardboard box, and is sandwiched between two pieces of studded blister packaging. The box features three transparent windows with a short character biography on the back. Also included is a colour leaflet showcasing other statues in the Diamond Gallery range which includes, amongst others, Spider-Man, The Incredible Hulk, Captain Marvel, Deadpool and an excellent Doctor Strange statue. The Iron Man statue is made from hollow PVC that admittedly feels light when held, but nonetheless looks great when placed on display. The statue is painted in metallic red and gold that both catches and reflects the light, and although there isn’t any colour shading in the paintwork, it isn’t really an issue as the metallic colours perfectly suit the statue. It really is impossible to take a bad photo of this statue. 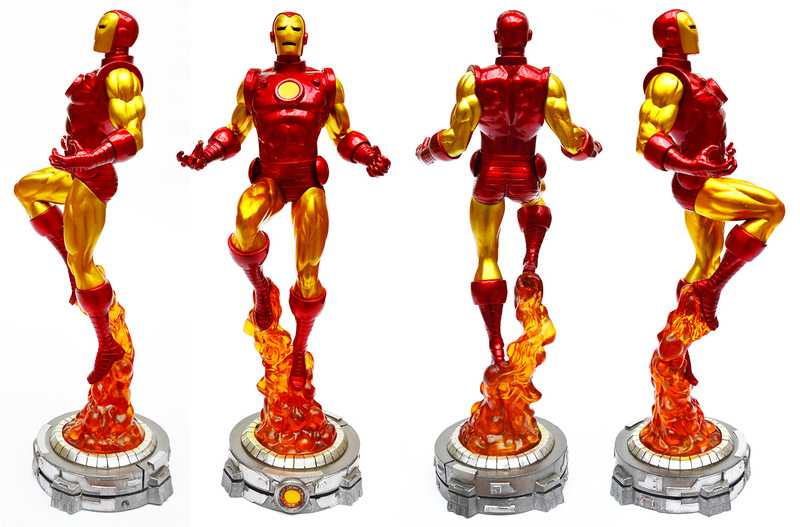 One of my favourite aspects of this statue is the translucent orange flame effect under Iron Man‘s boots — it reflects the light beautifully and gives the piece an added dimension of power and drama. 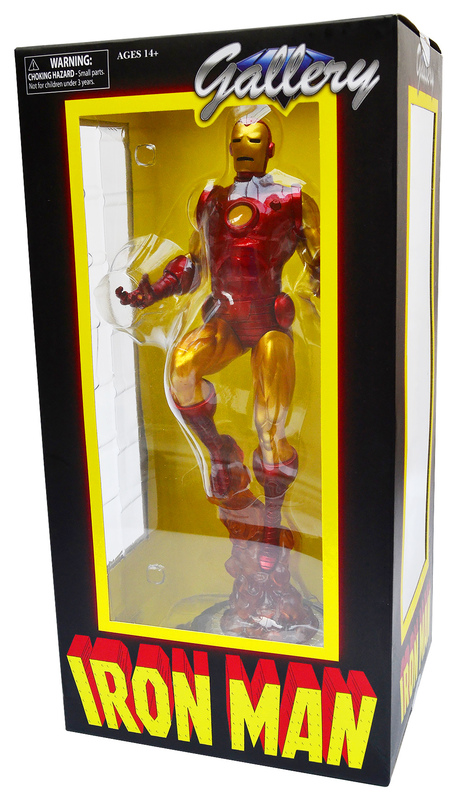 The Iron Man Diamond Select Statue is a great piece — both dramatic and graceful — but perhaps its biggest strength is its price: the statue’s RRP is £45/$45, which is amazing for a statue of this quality and size. The Iron Man statue, from all sides. Over the years Iron Man has been interpreted by many artists, and in many different ways. From the clunky grey armour first introduced by Stan Lee and Jack Kirby in 1963, to Adi Granov‘s sleek version from 2005, to the current version familiar to fans of the Marvel Cinematic Universe, Iron Man has always changed to fit the times. For my money though, the best version is that from the late 1970’s; David Michelinie, Bob Layton and John Romita, Jr’s interpretation of the character — ‘Classic Iron Man‘ if you will — is definitive. Not only were the trio responsible for one of the character’s most memorable storylines (‘Demon in a Bottle‘) they also created one of the industry’s most iconic comic book covers. This wonderfully dramatic statue from Diamond Select Toys pays fitting tribute to their seminal version of the character.